From the classic Resident Evil video games we are proud to present our much anticipated, officially licensed Licker Diorama. 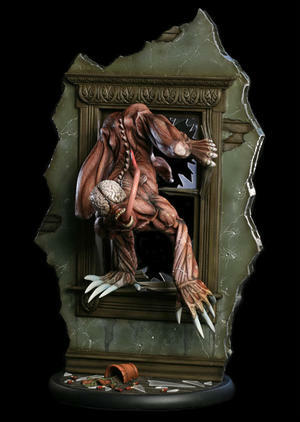 Bursting through a window of the mansion, this amazing sculpt captures the mutated creature in every detail in a full 360 degree diorama. No detail has been spared from the shattered glass and spent shotshells on the floor, to the claw marks in the outside wall. This incredible piece of art is constructed from heavyweight polystone and then hand painted to the finest detail. Limited to just 750 pieces worldwide. Stands approx 14” tall (1/6 scale).